Schonbrunn Zoo (German Schönbrunn Zoo) is the oldest zoo in the world, founded in 1752. It is located in the gardens of the famous Schonbrunn Palace in the west of Vienna and can easily be reached by underground from the city centre. In addition to the palace with its park and zoo, there are several other sights in the immediate vicinity such as the palm house, the desert house and a maze. All these attractions can be combined in a day trip. Unfortunately, the zoo experience is no longer inexpensive in Austria either. Adults pay 18,50 Euro entrance fee in 2019. Children up to 18 years, pensioners and disabled persons pay 9 Euro. There is no entrance fee for children under 6 years of age. Often you have to wait long at the cash desk. It makes sense to buy tickets in advance on the Internet. Such tickets are available on the well-known web page Getyourguide.de. The entrance tickets cost here just as much as at the zoo (18.50 for a zoo ticket and/or 9 euro for children starting from 6 years). The many visitors and children in the zoo especially like the big animals. The elephants have a large area, which can also be observed from above, from a hill. For the giraffes, a new, large facility is currently being built (status 2017) (Aktuell 2019: Meanwhile, the great giraffe park is finished). The hippos can be seen swimming in the water in their building. The zebras of the subspecies Burchell zebras from southern Africa are striped in an unusual pattern. A crowd-puller in the Vienna Zoo, as in many zoos, are the big cats of prey such as the rare Siberian tiger, the African lion, the polar bear, the jaguar from America, the cheetah and the leopard (extremely rare amur leopard from Russia and China). Other large animals in the Vienna Zoo include giant water buffalos from Asia, reindeer and rhinoceroses (tank rhinoceroses from India). Also smaller animal species are not less interesting. For example, we liked the meerkats, which can be observed from a short distance. Great and modern is the penguin enclosure with three species (rock penguin, king penguin and Humboldt penguin). 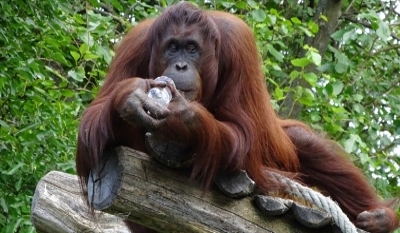 For many zoo guests the monkeys in the monkey house, like the orangutans, are a highlight. Not only children like the native farm animals like donkeys, ponies, sheep and goats. In the back part of the zoo there is a large farm from Tyrol (Tirolerhof) and a treetop path. Vienna Zoo is famous for its panda bears, which have been living in Schoenbrunn Zoo since 2003. The couple gave birth to a young Giant Panda for the first time in Europe in 2007. After that, there were several more offspring, a total of 5 kittens, most recently twins. Unfortunately the father Long Hui died of cancer in 2016, the mother Yang Yang now raises the two little twins alone. In the house of the pandas, or in good weather in the open air, there is always a dense crowd. You have to bring some time with you if you want to see the pandas well. Big pandas are so rare that they only live in a few zoos. Currently the pandas are the only ones with German-speaking countries. There are also large panda bears in Madrid, Edinburgh (Scotland) and in one zoo each in Belgium and France. Another great achievement of the zoo at Schonbrunn is the rescue of the Batagur turtle from India and Bangladesh from extinction. About 10 years ago there were about 20 specimens of the rarest turtle species in the world. Thanks to a breeding programme in Schoenbrunn, there are now far more than 100 animals of this species again. The breeding of Waldrapps is also a great deed of the Tiergarten in Vienna. This large, conspicuous bird was once widespread throughout Europe. Later almost completely exterminated because of the tasty meat. Today, the Waldrapp (an Ibis species) is being reintroduced, especially in Austria and Germany. There is everything from a simple snack stand to a restaurant. The prices are a bit higher than in the city, but still within reasonable limits. We really liked the parlour in the Tirolerhof farm with small traditional dishes and drinks from rural Austria. There is a large restaurant in the Tirolerhaus next door where you can order main courses such as schnitzel with potatoes, cheese noodles or goulash with dumplings (all around 10 euros, as of 2017). As desserts you can order the famous Sacher cake or delicious curd cheese nougat dumplings (curd cheese). If you need or want to save money, you can bring drinks and possibly something to eat with you. Under no circumstances should you feed the animals in the zoo. 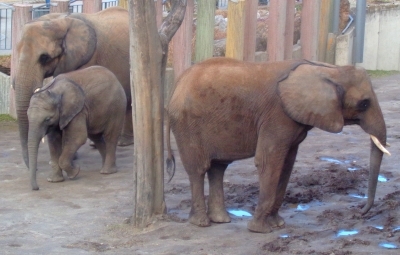 After its foundation in 1752, the Vienna Zoo was initially not open to the public. This changed around 1800, when there were already elephants, lions and bears in the zoo. New animals, such as the first giraffe, were a sensation in Vienna and throughout Austria. At the end of the 19th century and the beginning of the 20th century, the Schoenbrunn Zoo became more and more a modern zoo under the long-time zoo director Alois Kraus. Like most large zoos, the zoo in Vienna has no rest day. In summer, from April to September, the opening hours are 9 a.m. to 6:30 p.m. During the rest of the year, the animals can also be viewed from 9 a.m. onwards. Due to the earlier darkness, the Schönbrunn Zoo closes in the late afternoon in November, December and January at 16:30, in February at 17:00 and in October and March and 17:30 (February 2018). If you can’t or don’t want to go through the whole Schönbrunn Zoo, you can take a train (small train on wheels with several cars) through the complex (only from April to October, you have to buy an extra ticket). The zoo in Vienna is worth a visit at any time of the year. Some animals are even better in winter in the building and from a shorter distance than in the large outdoor enclosure in summer. 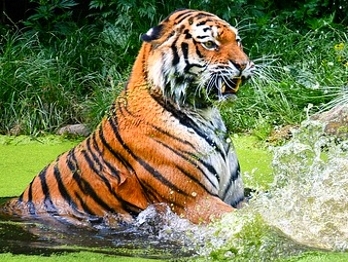 There are a total of about 700 animal species to be seen on an area of 17 hectares in the Vienna Zoo. Unfortunately, during our visit in March 2017, some buildings like the Rainforest House were closed due to the bird flu. But as far as we know this is no longer the case. Also the desert house outside the zoo was understandably not open to the public for the same reason..
See also: The Zoo Rome in the central park Villa Borghese and the great Zoo of Prague in the czech capital.